Free anniversary poems. Show them you remember. Let them know you care and are thinking about them with a high-quality wedding anniversary verse. Wedding anniversary wishes should make the recipient glad they are married, as this free verse, happy anniversary poem does. 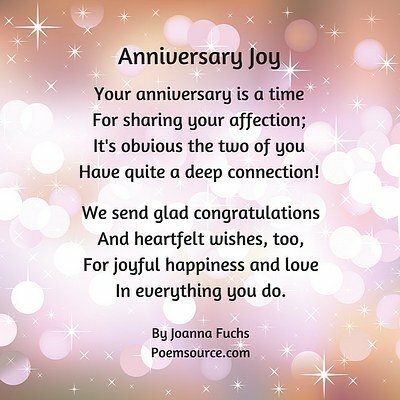 Years together, shared memories and much love make an anniversary special, as this rhyming anniversary card poem describes. Videos! Click the upper right corner for sound on/off. See colorful and entertaining ideas, demonstrations, and helpful information. 50th Anniversary Poems for those golden wedding anniversaries. Greeting card poems are often bland, but the following anniversary message will make an enduring impression on the couple who receives it. This poem for an anniversary will remind the recipients of why they value each other. Anniversary poetry should express both congratulations and affection, as this anniversary verse does. Anniversary wishes should make the recipients feel good. That's the way this verse is written. An anniversary is a special time. Anniversary poetry celebrates the joys of marriage. This anniversary wish focuses on a happy couple. Anniversary messages can be general or specific. This one can be put on just about any kind of anniversary card. It could also be used as an anniversary toast. Here's an anniversary verse perfect for the anniversary celebrants who are your best friends. Here's a free wedding anniversary poem for a very happy couple. My marriage with Karl is like this; I hope yours is, too. Did you guess it would still be as good as this? And each new anniversary is the best. This anniversary poem will fit nicely in a card you can give or send to mark the special event. Your marriage is a treasure. Joy and peace and pleasure. Some wedding anniversary poetry rhymes; some doesn't. This free verse happy wedding anniversary poem is perfect as a greeting card poem. a marriage that defines "forever." Anniversary poetry comes in different formats. This wedding anniversary wish is a toast to the happy anniversary couple. Wedding anniversary poems can include God's love and guidance. This anniversary verse does that, and it also cements the bond between the giver of the poem and the happy anniversary couple. And guide you on your way. Anniversary poems can send good wishes while commenting on the strength of the marriage, as this anniversary message does. This free wedding anniversary message, in free verse, is a happy anniversary poem suitable for a greeting card. You two are an inspiration to the world. and love triumphs over all. Here's an anniversary love poem from husband to wife. My sweet, adorable, lovable wife. Like eating wonderful treats from a limitless bowl. We're lovers and partners in all that we do. Happy anniversary to my own special one. This romantic anniversary love message should create good feelings for a happy anniversary! Yet days spent with you still make me smile. You've brightened my life through every year. Life with you is really great. Every minute with you is like heaven above. Happy Anniversary to you, my cherished, true love. I am surprised at the number of searches for all kinds of greeting card prayers, including anniversary prayers, so here is an anniversary blessing. With a comfortable home and a happy life. Contentment, joy and lots of friends. We pray they'll turn their hearts to you. Here's an anniversary poem that can double as an anniversary toast. So here's to you: Three cheers!